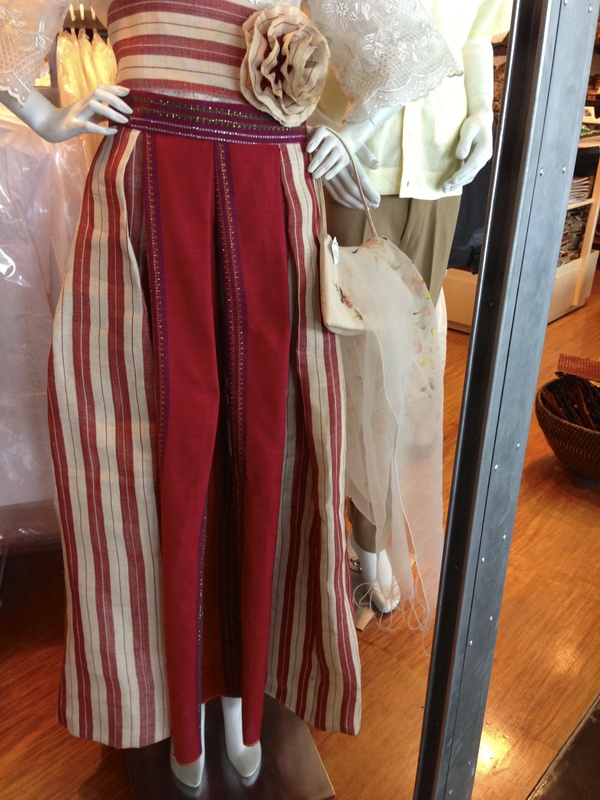 I tried to gather a few pictures of textiles that you would enjoy seeing. I am wearing a cotton tie-dye scarf I found in a Makati store. 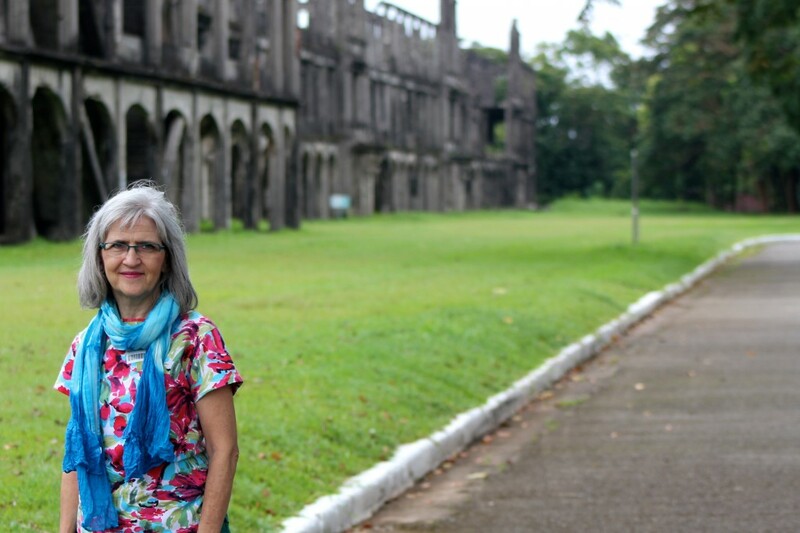 We learned interesting World War II history on our day trip to Corregidor Island. 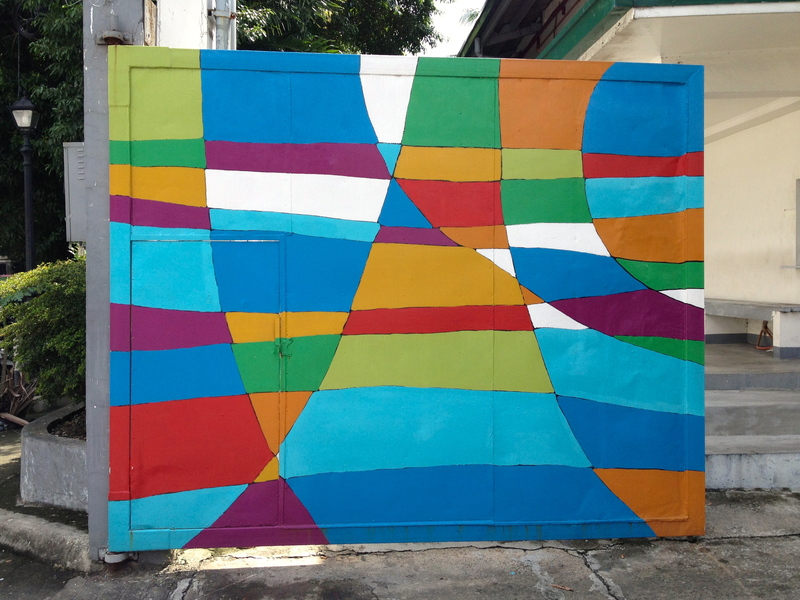 Interesting painted metal gate in Makati. I instantly saw it as a potential tapestry design. 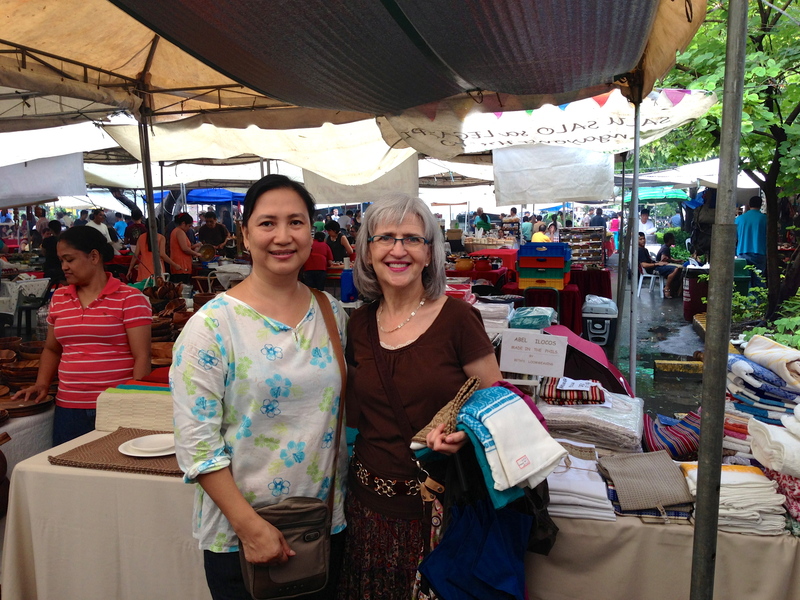 Found a fellow handweaver at the Sunday market. Beth has ten looms in her workshop in Vigan, where she and other weavers produce beautiful cloth, mostly from cotton thread. 40/1 cotton is Beth’s most used fiber. Beth identified this weave pattern as the most unique to The Philippines. I am sorry I failed to write down the Tagalog name for this and the weaves in the following pictures when Beth told me what they were. Beth is a third-generation weaver. 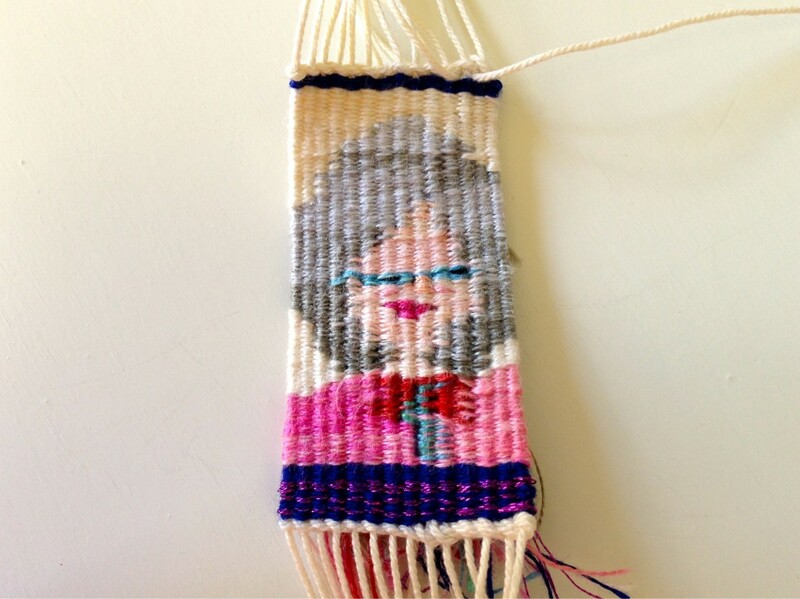 She has woven this pattern for many years, but just learned four years ago that it is called “Overshot” in English. 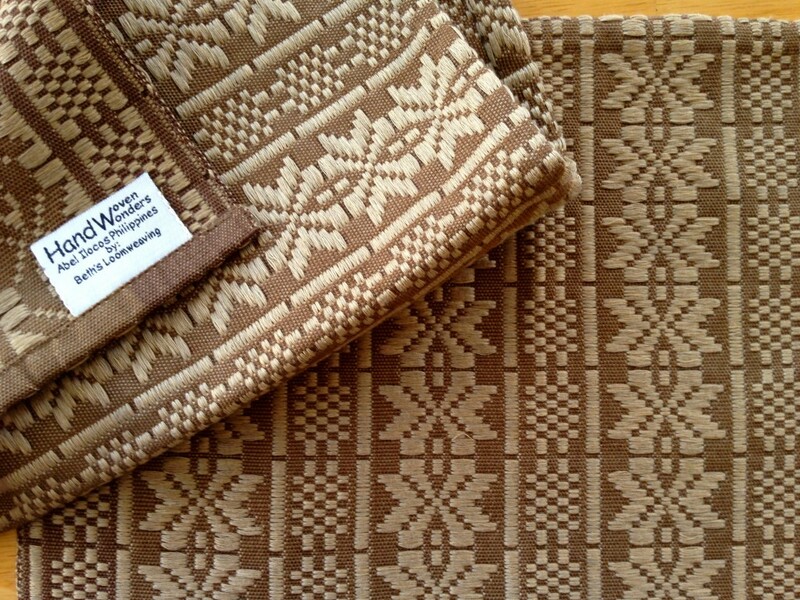 HandWoven Wonders by Beth’s Loomweaving. 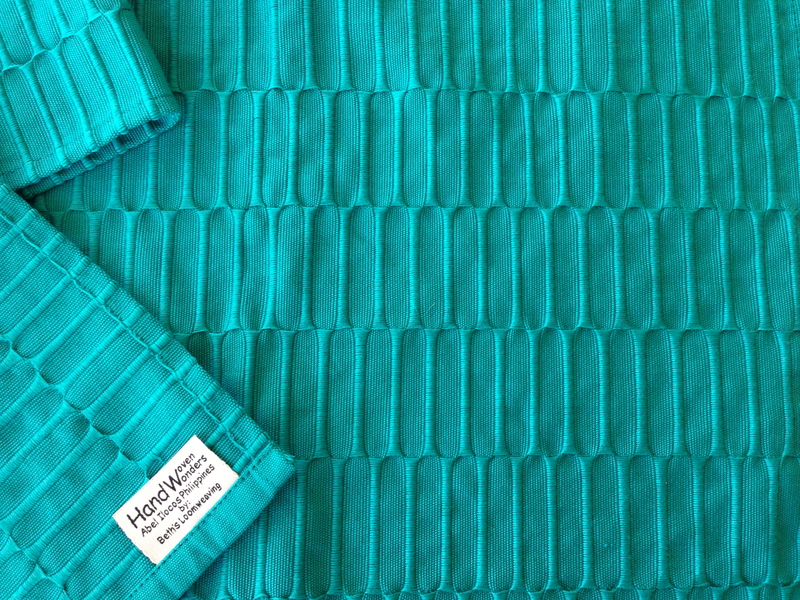 Stunning turquoise cotton table runner is two yards long. Ayala Museum has fascinating displays depicting various aspects of Philippine culture and history, including a display of 1800’s handwoven and embroidered clothing (picture-taking not allowed). I found these ikat woven coin purses in the museum gift shop. 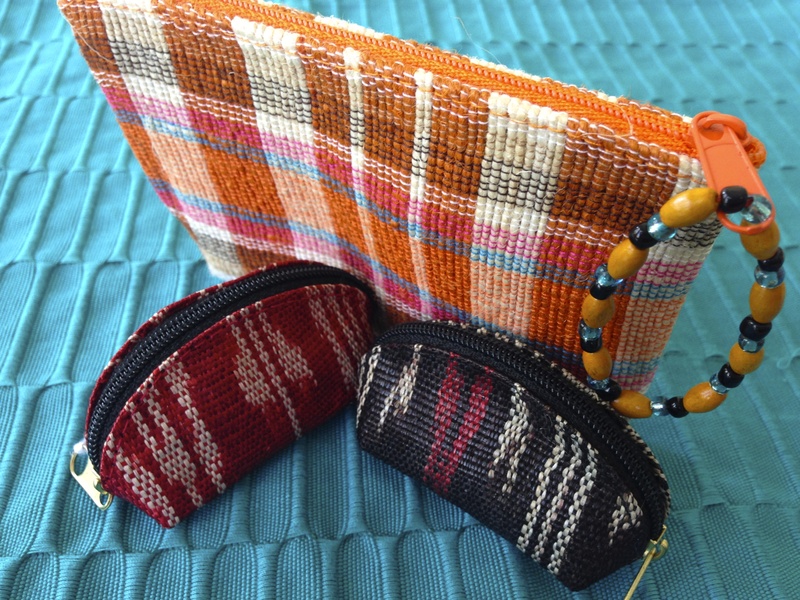 The woven plaid zipper pouch is from another market vendor. 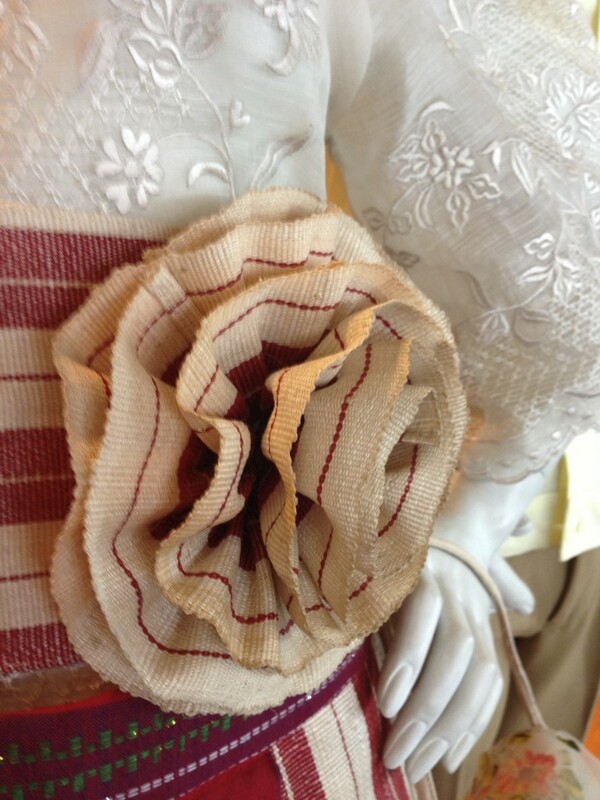 Wide handwoven band is gathered and stitched to form a “ribbon rose” that embellishes the sash. Neatly folded piles of colorful handwoven items at a shop in the Manila airport. You didn’t expect me to come home empty-handed, did you? 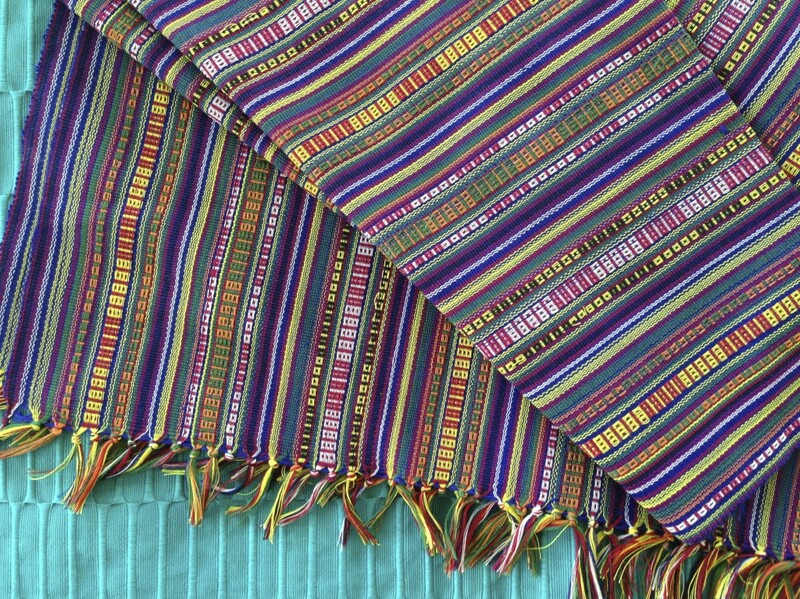 Vibrant multi-colored cloth with intricate design. Perfect for a Christmas table runner. 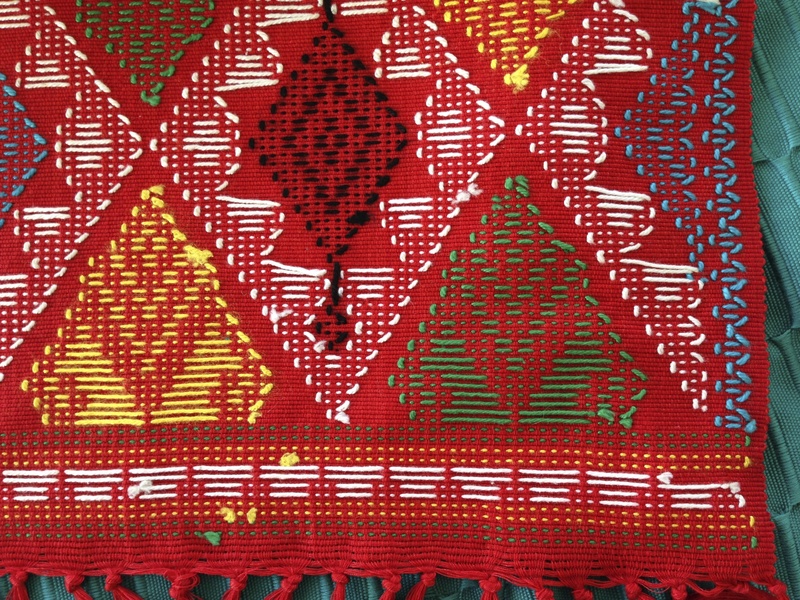 Notice the long thread floats and knots on the reverse side of the red cloth. Detail of the warp-faced weave of the colorful striped cloth. May you step into a joyful journey. Hi, Lynn! Thanks for your kind comment. It’s no secret I’m attracted to beautiful colors. The big umbrella shows how fun a 3-yr-old can be. 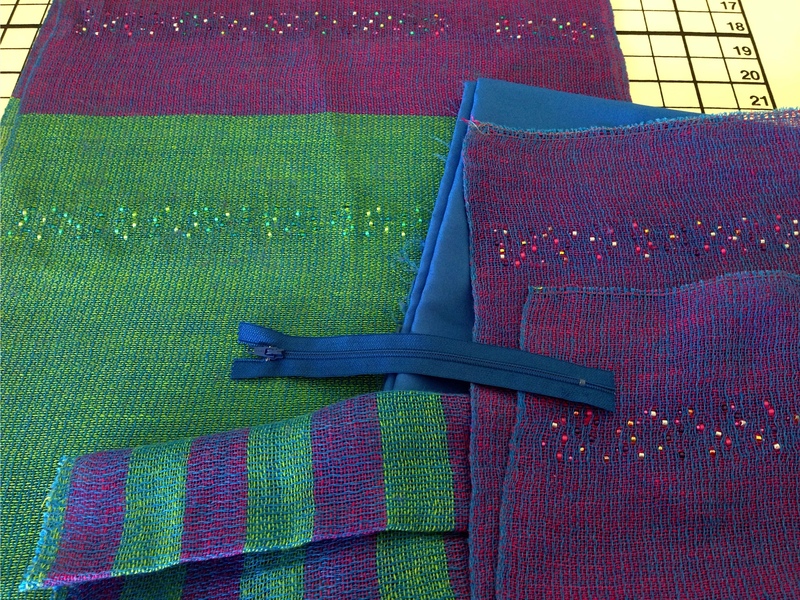 I was looking at your weaving where you added a beaded weft. I didn’t see anything on how it was done. I am about to tackle something pretty large and the bead inlay would be REALLY helpful. Can you email me data? Certainly! This post, Linen and Beads, has the best pictures to show how I did it, but I didn’t fully describe the process. I am happy to email you with more information. Wonderful colors and textures! I especially enjoyed the photo of you and your sister-in-weaving: fun. The size of the umbrella in comparison to the tiny thing holding it – too funny. Little tennis shoes moving with purpose: this girl is on a mission ; D lead, follow, or get out of the way! LOVE – what a blessing you got to enjoy her in person. Betty, you very aptly described our little granddaughter’s mode of operation: lead, follow, or get out of the way! Ha ha, she’s a joy. I am Val Salting from the Philippine Statistics Authority. 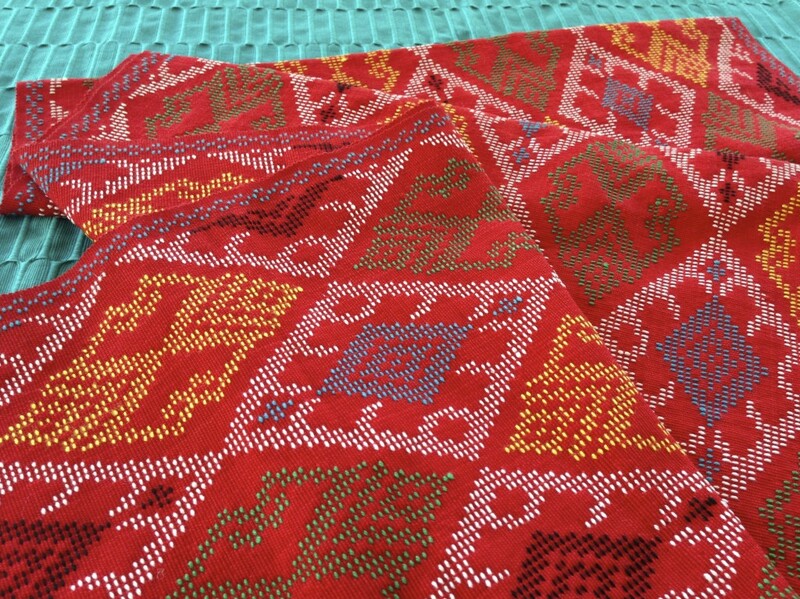 I came across one of your picture when I am looking for Philippine textile to use as cover for one of our publication, the Philippines National Demographic and Health Survey. This survey is about fertility, family planning and maternal and child health situation in the Philippines. 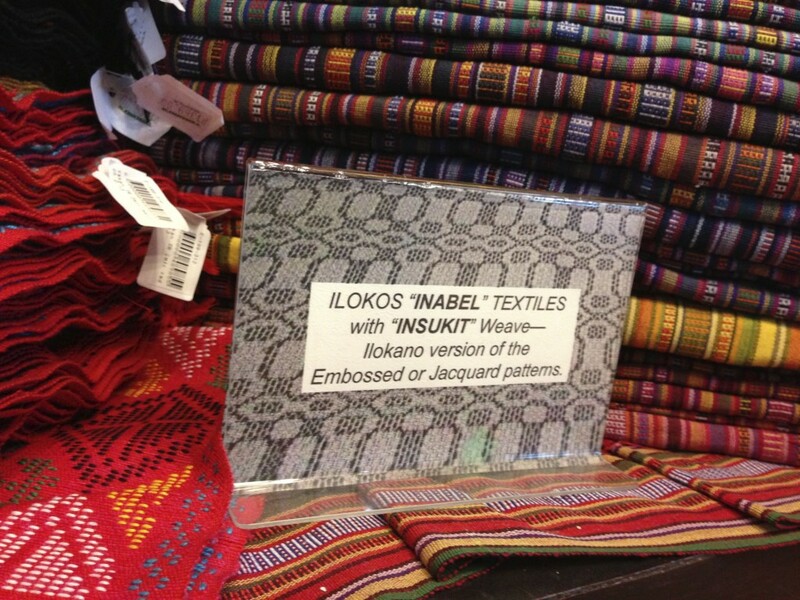 Our past reports uses Philippine weaves and textiles as cover. I would like to ask permission from you to use one of your pictures as part of the cover of our publication : http://www.warpedforgood.com/wp-content/uploads/2013/09/Detail.jpg. Or if you have a high resolution of the cloth you could email to me. Proper credits for your picture will be included in the publication. I could furnish you past publications for you to see. Please do email me if you have some more questions. Thank you and good day. Hi Val, Yes, You are welcome to use the picture for your publication. Thank you for asking. I don’t have a high resolution photo to send you. A warp that has not been properly wound on at the start will be full of problems every inch of the way, compromising the quality of the finished cloth. One thing that helps ensure an evenly wound warp is tension. I lay warp chains on the floor in front of the loom, weighted down with bricks and walking weights. The weights provide resistance for winding the warp over the back beam onto the warp beam, giving tight and even tension. People need tension, too. Looking toward the warp beam at the back of the loom, from under the tightly wound Cottolin warp. Given a choice, I would like no tension, thank you. Just give me some slack. Do you know that the tension you and I would rather avoid could be the very thing that makes us shine? Tension is uncomfortable, stretches our limits, and can bring out the worst in us. It tests us. But testing has positive results. Our maker knows that. His testing of our hearts reveals our true identity by confirming our deeply held convictions. 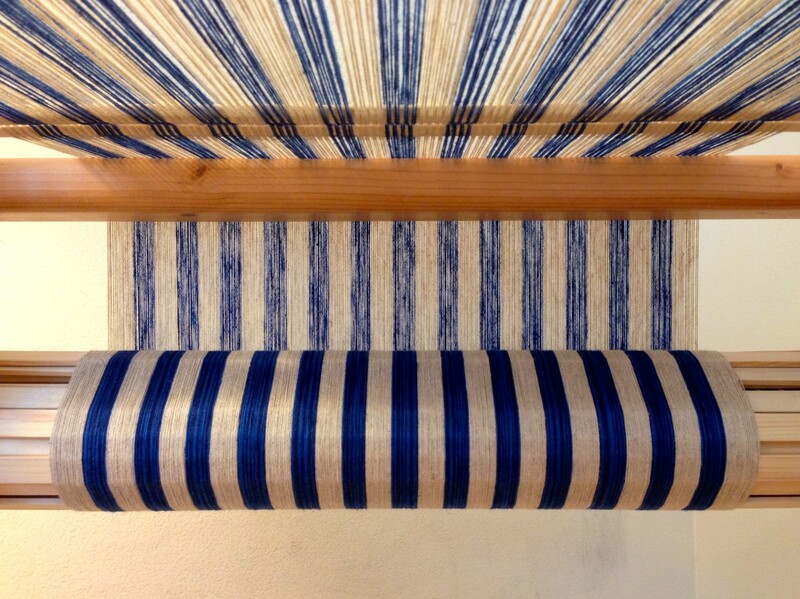 Any loose or broken threads hidden in the warp become apparent, so they can be repaired or replaced. And we are made ready for the rest of the weaving. May you find gold and silver threads shining in your warp as you become refined through testing. Have you ever been refined through tension? I have been enjoying your blog for a couple of months. I am so happy I found you. I get encouragement in my walk with Jesus, and weaving information, at the same time. What a blessing. Thank you for sharing! Lisa, you have really made my day! Thank you for the huge dose of encouragement. It’s wonderful to have you along. 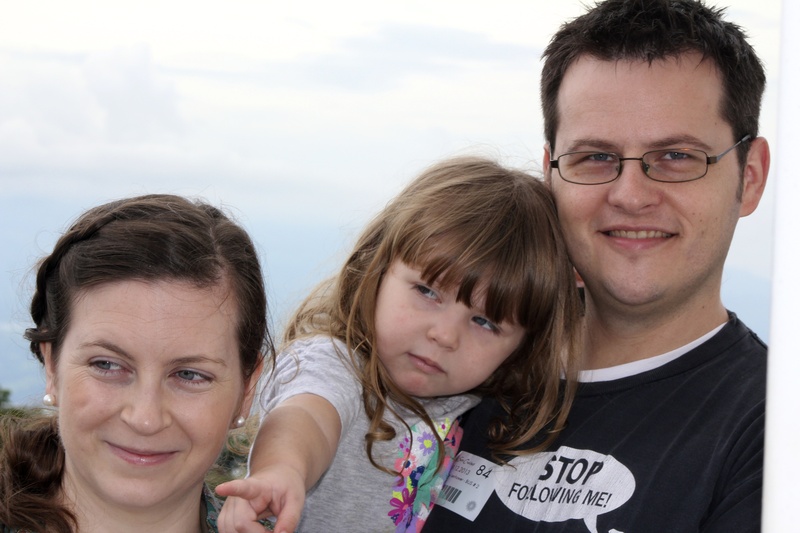 Steve and I just returned from visiting our son, daughter-in-law, and our adorable three-year-old granddaughter in The Philippines. So, I was away from my floor looms for a couple weeks! But thanks to my husband, I have a miniature tapestry loom that works perfectly for travel. 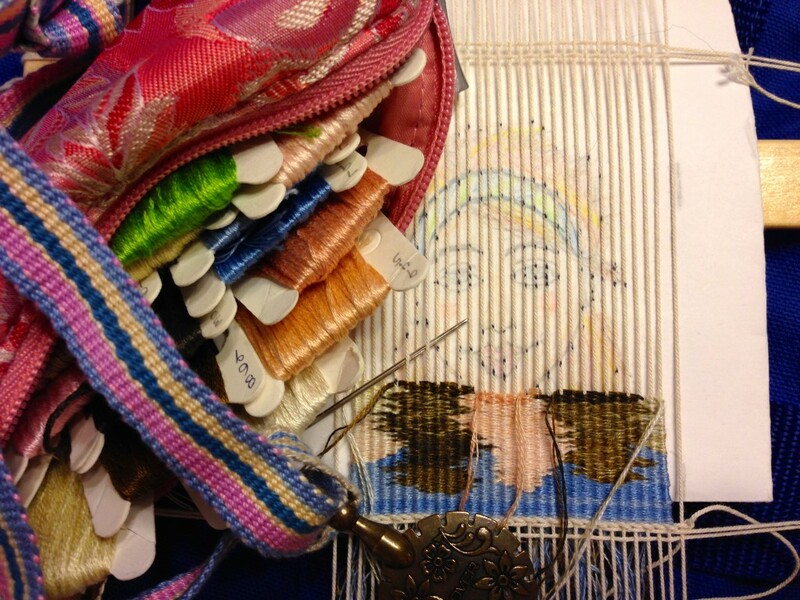 About the size of an iPad, it is small enough that I can weave on the go, even on an airplane. 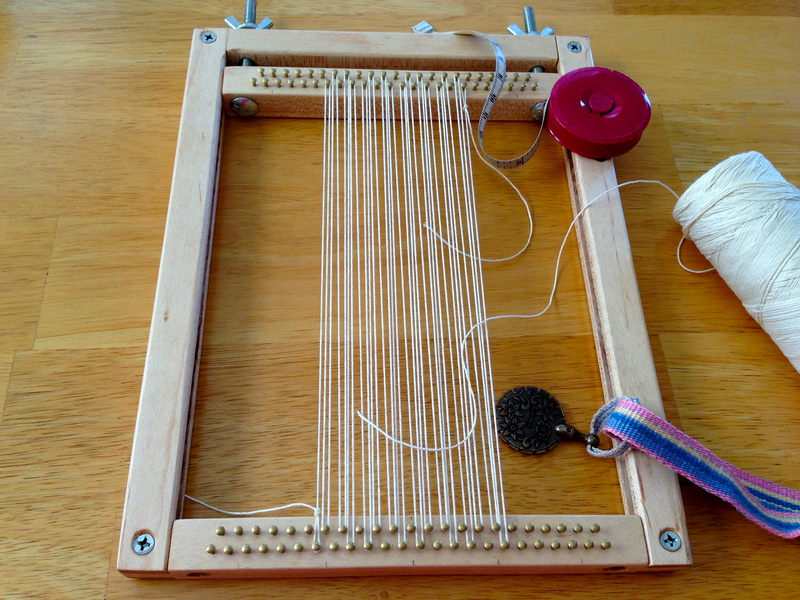 Hand-built small frame tapestry loom, designed with offset brass nails to hold the warp, with tensioning device at the top. Why not take along knitting, crochet, or tatting, you ask? I agree, that would be sensible; but I am a weaver, and I would rather weave. With cartoon in place under the warp, and thread selection collected in a small pouch, and thread cutter to hang around my neck, I have everything I need to weave on the airplane. Oh, and a small book light for weaving in the middle of the night. Haha! Your creator has a meaningful role for you that is perfectly suited for your skills. Wouldn’t it be silly for me to try to use this frame loom to swing at a tennis ball, or strum it like a guitar? Steve made this loom specifically for me to weave small tapestries. This simple frame works beautifully for that purpose, giving credit to its maker. When we find that satisfying role that allows us to practice using our gifts to their best advantage, it reflects well on our maker. May you find a way to do what you do best. What a marvelous travel loom design! Thank you for posting about it. I will share this with my husband to see we can come up with. I especially love your statement about the purpose of your loom. I’m so glad you stopped by! I hope you have success in making a loom that works for you. Love your loom. I had seen something similar a while ago. Could you please let me know how you spaced the nails so precisely? And at what spacing from each other.? And where would I get similar nails? My husband’s engineering mindset makes precision a must. First, he lightly penciled the wood for the placement of the nails. Then, he used an awl to poke a hole at each spot. Then, he pre-drilled the holes with his drill press. And then, he tapped in the nails, trying to get them a precisely consistent height. I honestly don’t remember the spacing between the nails. I think I was trying to get a 10 epi sett, and making two offset rows was my attempt at that. If I were to do it again, I think I would do one row of nails, and double the warps to make a denser sett. You can get the small brass nails at a home improvement store, like Lowe’s or The Home Depot. Just wonderful, this little loom. I am restarting tapestry weaving and I thought I’d try a tapestry journal … but so much empty warp, for a month, a year, seems too much. I was thinking little mini tapestries every day, perfecting techniques until I had them pat. I’m off to see what I have in my leftover lumber bin. Hi Ainz, That’s wonderful! Sounds like you are going to have a delightful time getting back into tapestry weaving. One-inch-wide self-portrait tapestry. Cotton seine twine for warp, embroidery floss for weft. By taking care of our physical bodies, we promote health and well-being; and we gain necessary strength to face what comes. In the same way, I want to take care of my inner person. Taking in nourishment for my soul, exercising my faith, and finding the creator’s rest. That’s life. May you get the most out of life. THIS IS darling!! I am always intrigued by tapestries. In choosing a fabric to line these linen bags I am making, I find that the color of the lining makes a difference in the outcome. Different lining colors change how the linen looks. I decided on a blue satin lining that is similar in shade to the blue of the linen warp. Other colors seem to compete with the iridescence of the handwoven cloth. Once again, what is on the inside matters, and influences what is seen on the outside. The same can be said for people, right? 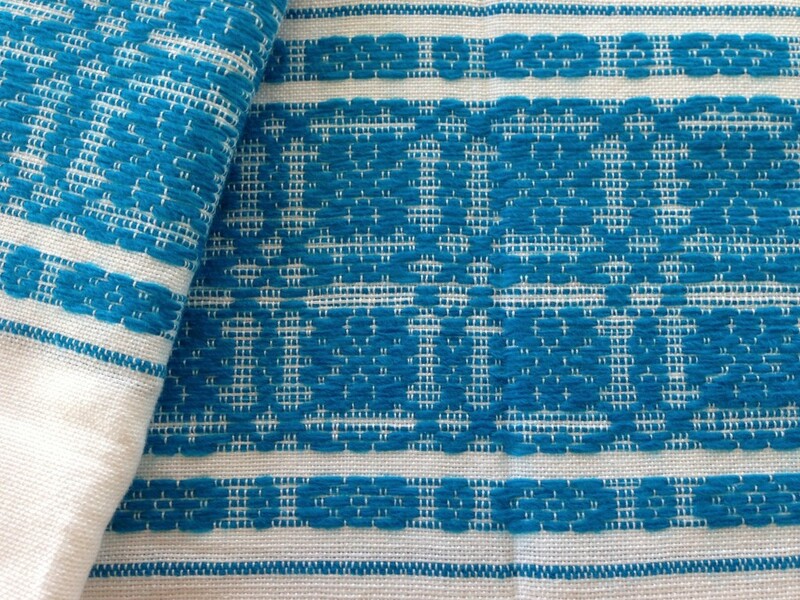 Linen fabric with beads woven in, ready to be made into satin-lined bags. 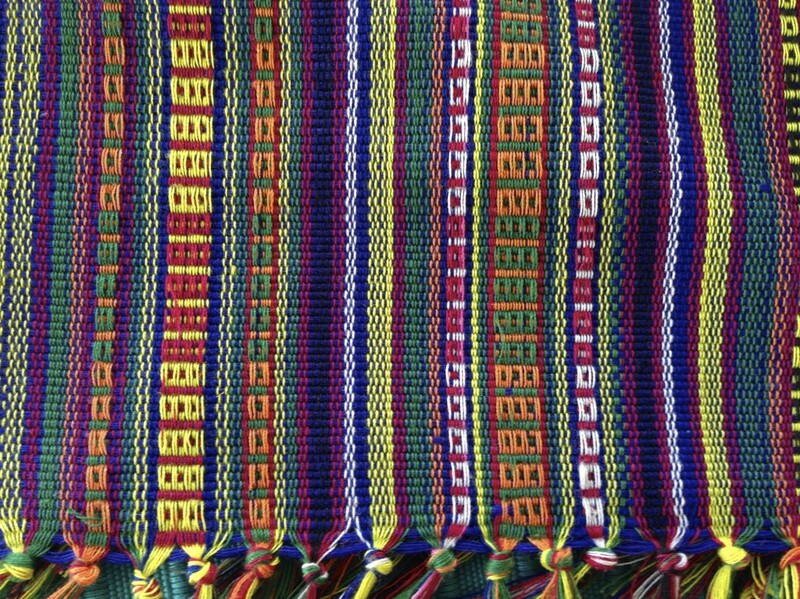 Small striped sample from the end of the warp will be made into a small clutch purse. Faith in the master weaver is the lining that shows through the fabric of one’s life. A stance of faith creates an inner calm that carries you through every storm and every celebration. It is the color that shines through. May you calmly face your next challenge.